Askové designs and builds plastic processing equipment and turnkey processing installations. The heart of their business involves the utilisation of thermoplastics. Askové specialises in finding practical and efficient applications for the handling or processing of gases and/or liquids in industrial processes for its customers. Askové is a top quality, highly certified, flexible and reliable partner for its customers. Air Treatment - The purification of air from industrial processes provides a clean and fresh environment. Defense Ground Support Equipment - Ground Support Equipment must meet very high requirements set by the armed forces. Water Treatment - Water Purification - There are many different methods for water treatment and water purification. Chemical Storage and Pipeline Systems - Plastics make numerous applications possible for chemical storage and piping. Dosing - Mixing - Dosing and mixing is at the heart of processing liquids and substances. Surface Treatment - Surface treatment is a crucial pre-treatment for many materials before these are processed further. Plastic Equipment and Devices - Plastic is the basis for numerous speciality products for industrial applications. Assembly, Service and Maintenance - Askové provides on-going support on installations at customer sites. Askové is ISO 9001, AQAP2110, VCA** and BRL K903 certified. On-site Assembly - Askové capabilities go beyond manufacturing and supplying from the factory. A significant service provided by Askové is the on-site assembly of Askové manufactured installations. Experienced project managers and foremen organise the work on- site in accordance with the VCA*** certification attained by Askové. The starting point for this work is safety. The Askové fitters install the equipment and the rest of the installation using extensive expertise in the field of welding/bonding, assembly, construction and commissioning. Installations are calibrated and delivered according to specification. Service - A mainstay of Askové’s capabilities is its service department. Over the years, circumstances may arise that require a installation to be serviced. Servicemen from Askové can provide the broadest possible maintenance support on Askové manufactured installations under the requirements of local conditions. In some cases, Askové servicemen can also provide maintenance on installations not manufactured by Askové. The expertise and experience of the servicemen from Askové guarantee appropriate and prompt service. Maintenance - Maintaining plastic installations will prevent unnecessary downtime. Askové carries out maintenance on the plastic installations of many of its customers. It is becoming increasingly common that this work is preventative maintenance. Askové servicemen carry out this maintenance annually at predetermined dates set out in an agreed maintenance timetable. These maintenance timetables are formulated based on the years of maintenance experience that Askové has gained with its plastic installations. 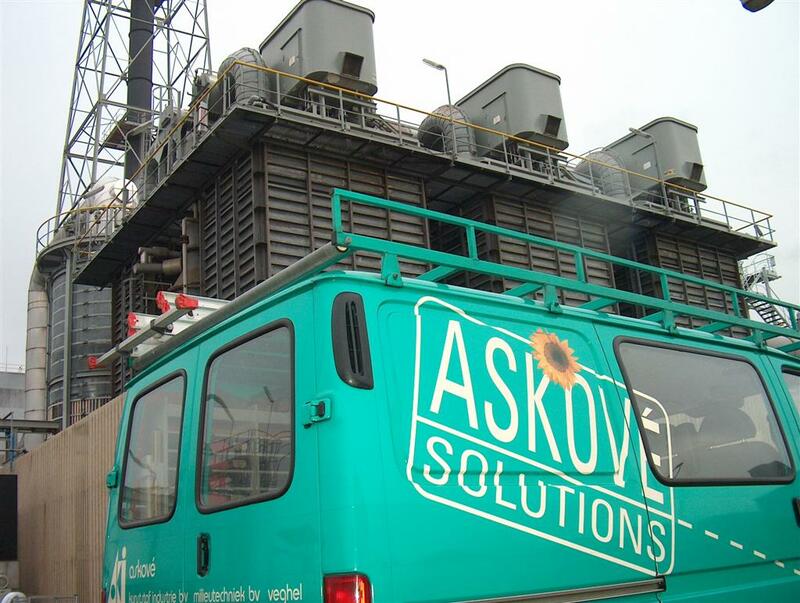 In some cases, Askové also carries out (preventative) maintenance on installations not supplied by Askové allowing it to take over the entire maintenance needs for its customer. This might include the chemical storage and dosage installations or the air treatment systems. Askové designs and manufactures a variety of special plastic components for the armed forces and, in particular, Ground Support Equipment for the F16. In close cooperation with the armed forces, these components are designed, extensively tested, and, after approval, manufactured for the various armed forces organisations. Askové can satisfy the high quality requirements of the armed forces because it is certified with the quality standard AQAP2110. 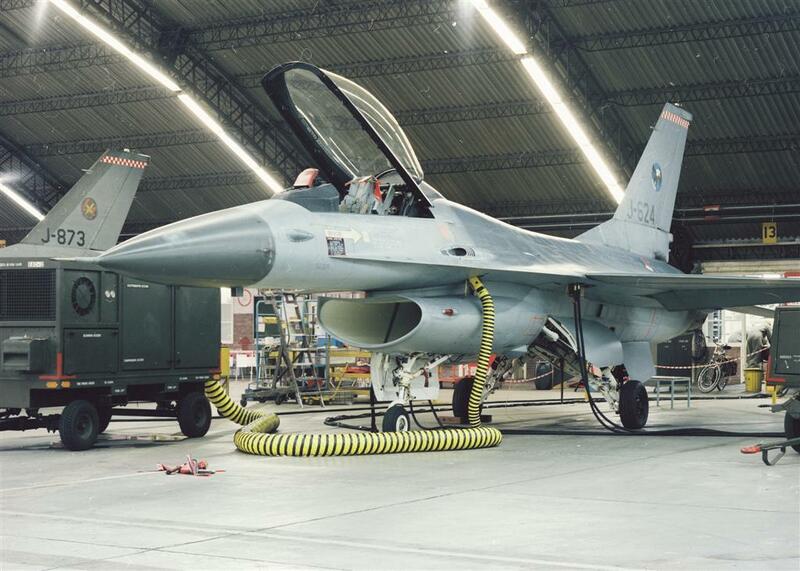 Devices that Askové has delivered to the armed forces for the F16 and others include Airco Connectors (ECS Connector) and air hoses, Fuel Savers, Hydrazine Emergency Box (HEB), chocks, HUD covers, etc. Upon request, we can provide an extensive description of the in-house possibilities that Askové can provide. Air purification and emissions treatment are becoming increasingly important for many companies. Population centres are advancing on industrial parks such that the nuisance from emissions and smells is becoming less acceptable. This is also increasingly supported by mandatory regulations from various government agencies. Askové has manufactured air purification and air treatment installations for a wide range of applications. Air Scrubbers - Gas Scrubbers - Scrubbers - Emissions of all types and characteristics can be released into the air from production processes. Each emission must be handled in a specific way for optimal removal efficiency. Odour Treatment - Askové has accumulated a lot of experience in designing and manufacturing odour treatment installations. 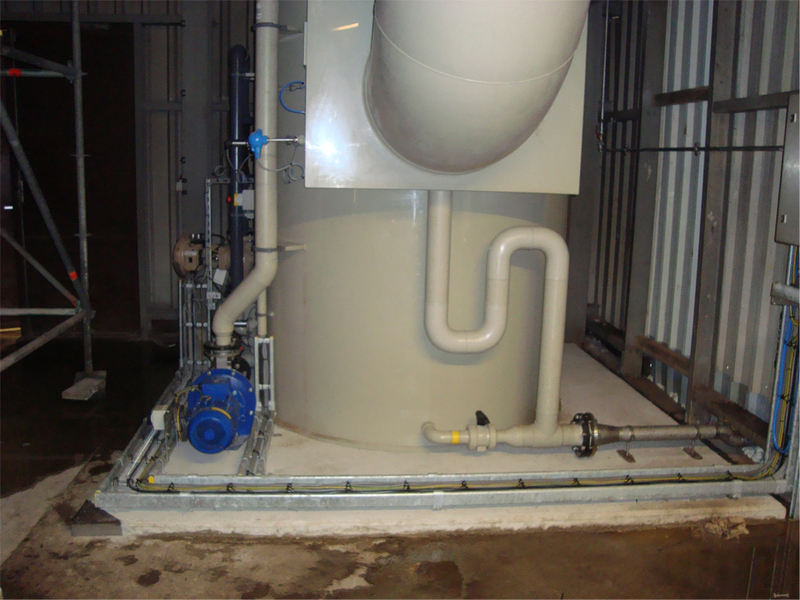 The manufacturing of scrubber systems led quite logically to odour treatment systems. However, odour treatment is more complex than the relatively simple treatment of chemical emissions such as ammonia. Odour treatment demands knowledge and understanding of the composition of the specific molecules of an odour and how to remove these from the air stream. 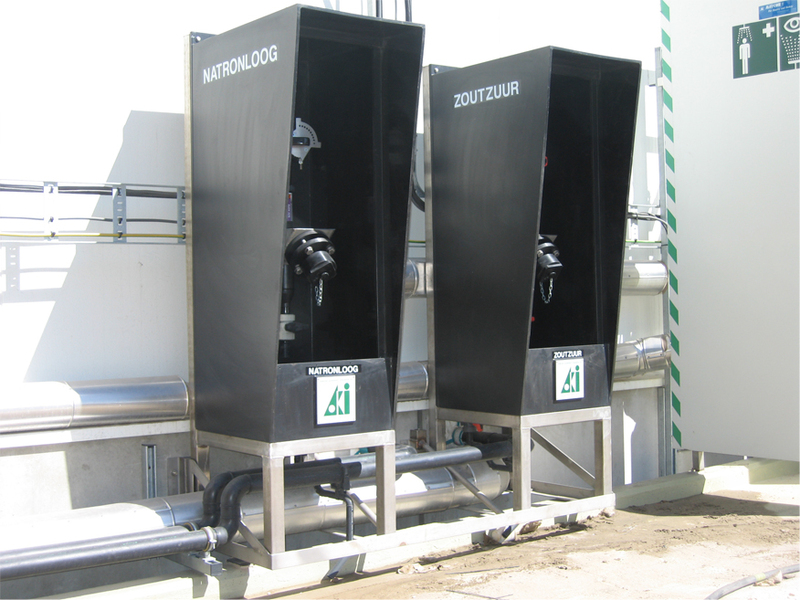 Askové has the necessary expertise and experience and has previously designed and constructed odour treatment installations with capacities up to 150,000 m3/h. Systems for larger air streams are also possible. Dust Removal - Dust Capture - Askové has constructed a variety of installations for the removal of dust from an air stream. Droplet Separators - In many situations, it is necessary to capture water vapour or water droplets. Droplet separators are integrated at various places within Askové air treatment installations. Droplet separators are placed in scrubber systems to prevent droplets escaping the scrubber and entering subsequent sections of the installation. Askové has a long history in the field of water treatment and water purification. Askové has supplied a variety of installations for water purification and treatment companies in The Netherlands. Recently, air treatment - air purification has become an increasingly important issue with water treatment. Odour treatment installations are needed to counteract odour nuisance because of the emissions released during water treatment. Strict regulations must be satisfied when designing and constructing chemical storage installations. In The Netherlands, this is stipulated in the guideline BRL K-903. This assessment guideline describes in detail what requirements a chemical storage installation must satisfy. This guideline also stipulates that this type of installation may only be designed, constructed, and installed by REIT certified fitters. Askové has been certified since 2010 and is thus authorised to provide the necessary installation certificates for chemical storage installations. It is of the utmost importance to choose the correct materials for chemical storage and chemical pipelines. Askové has in-house experience gained from years in the field designing and constructing chemical storage installations. It is more than qualified to make appropriate choices for every conceivable application of chemical processes. Plastic Chemical Tanks - Askové has supplied (chemical) tanks in all sorts and sizes for most of the (chemical) installations it has supplied. 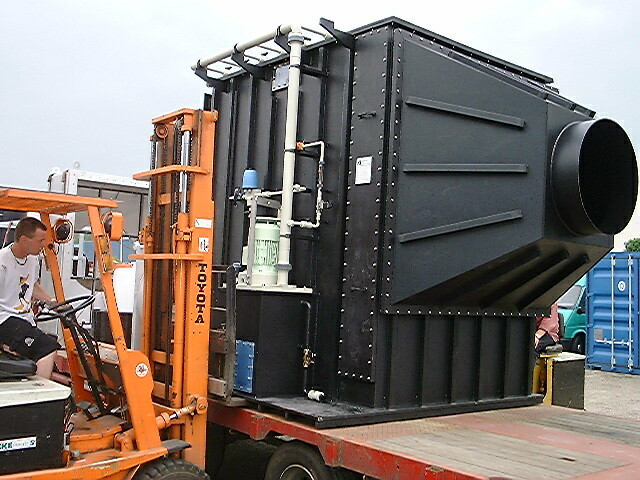 Askové can design, manufacture, and deliver these tanks with all the necessary certificates. Askové’s range of tanks comprises cylindrical, rectangular, and specially shaped tanks. Plastic Pipelines - All Askové installations come with all kinds of plastic pipelines. Askové also supplies plastic pipeline systems separately from its other installations. Askové can lay plastic pipelines with diameters exceeding 2,000mm in almost all available thermoplastics, circular and rectangular, single-walled and double-walled, with leak detection systems, etc. Plastic pipelines are laid with all the necessary brackets by our certified Askové fitting service according to the specific needs of the customer. Mixing Installations - Askové supplies custom-made mixing installations. The mixing may involve a specific dosing of water with one or more chemicals at the same time. A mixing installation is often part of an entire process and outputs a dose to a subsequent step. Dosing Installations - Dosing installations are manufactured by Askové for numerous applications. These are primarily used for chemical dosing in all kinds of processes. The company also uses them with their chemical scrubbers. It is critical that the correct choice is made for the most suitable plastics and components for the dosing medium ((dosing) pumps, valves, measurement and control devices, etc.). The years of experience that Askové has gained in this field ensure that we will make the most accurate and practical choice. Galvanisation - Askové has manufactured installations for numerous applications for the galvanisation industry. The Company has supplied galvanised baths in numerous sizes and shapes and also all the peripheral devices used in conjunction with the galvanised baths. Such devices include chemical storage and pump installations, and gas scrubber installations for air treatment processes. Microelectronics - Askové supplies installations to microelectronics companies. These include simple line etching devices to fully automatic robotic pre-treatment installations for wafer plates, etc. This industry has extremely rigorous requirements concerning the manufacturing process environment, which Askové profits from due to its considerable flexibility in designing and manufacturing solutions. Askové is a long-established designer and manufacturer of special plastic constructions. This can vary from small special devices and components to completely integrated sections for a production line. The engineers and production staff at Askové have the expertise and experience to find the most appropriate and practical solution to virtually any problem. The Company supplies all these types of special projects according to the specific needs of the customer.